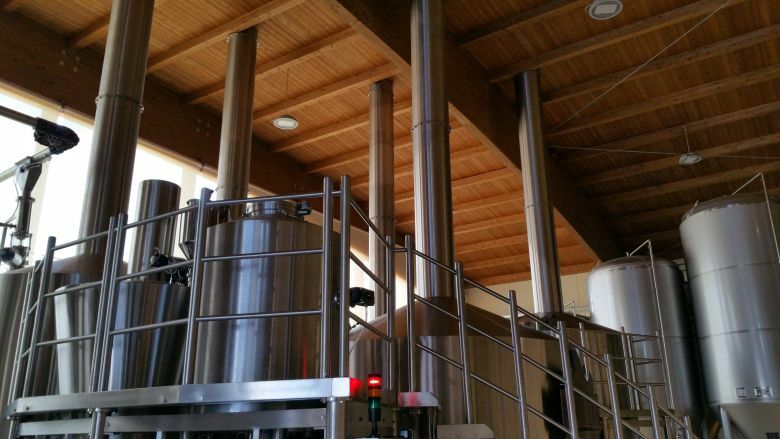 Modular brewhouse supplied by Enterprise Tondelli brewhouse manufacturer Simatec of Turin. With an area of 1600 square meters Birrasalento is the largest craft brewery in Puglia and also one of the largest in Italy. 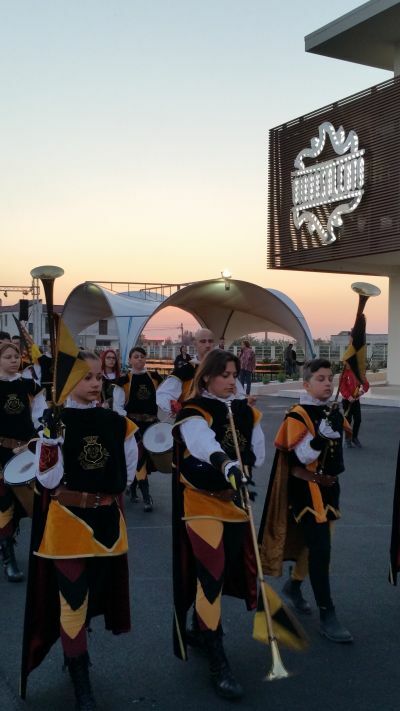 At the grand opening the provenance of the brewery was in evidence with such activities as the Italian medieval flag throwing or Sbandieratori along with Corde lisse or rope acrobatics and a band playing Pizzica music which is very typical of the region. The new brewery which is the brainchild of Mr. Maurizio Zecca was inspired by letters from his father who left Italy in 1963 to look for work and found it in a brewery in Switzerland. Reading those letters as a young man planted a seed that was later to find its realisation in the new Birrasalento Brewery. The brewery is rooted in the landscape and region with the barley being grown a stone’s throw from the brewery. Trials were carried out on barley varieties with the University of Salento over a number of years before finally settling on Concert and Odyssey after 5 years of experimentation. Water is sourced from a private well adjacent to the plant and with the inclusion of local spices and ingredients. The only item not found locally is the hops which cannot grow in the local climate. The brewery produces a range of interesting beers including the flagship Pizzica which has hot chilli peppers in the recipe. This beer is inspired by the local Pizzica music typical of the region and part of the Tarantella family of music. The dance starts off slow and increases in speed and tempo to a finale – a bit like the beer with hot chilli peppers in it that are not overpowering but very subtle and distinctive. Originally danced to cure spider bite whilst working in the olive groves and vineyards……..
Other brews include Taranta, Beggia, TIPA, Fresca and Nuda & Cruda which include a Belgian style fruit beer, Hellas, pils and a blanche IPA. With such a wide range of beer styles beer being produced it was imperative to have a very flexible and modular brew house. This would allow shorter runs but on a regular basis so the beer is always fresh. 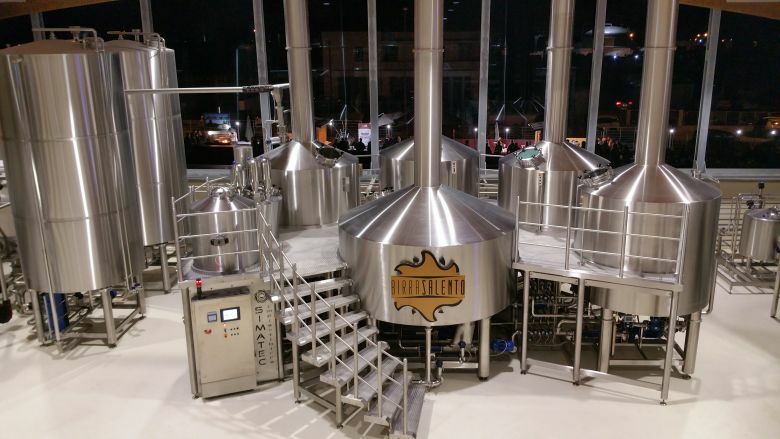 A “Top modular” 48 hectolitre Simatec brewhouse was installed which as has can produce 12 brews per day using a unique five vessel system that transfer the wort only twice thus reducing hot oxidation. 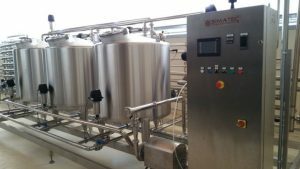 Simatec work with Enterprise Tondelli in supplying brew houses / breweries in the UK markets as well as some international markets where they are active. Already Enterprise Tondelli have a number of Simatec brew houses in the UK market ranging from 12 hl to 24 hl. The patented system which is common to all Simatec brew houses feature a multi-function vessel that acts as the mash vessel/copper and whirlpool with a special lauter tun. The Simatec “Top modular” range is aimed at the 48 – 96 HL brewhouse market for large flexible volume production. The modularity comes from the fact you can start with one multi-function vessel and one lauter tun and then as the volumes grow additional multi-function vessels can be added up to a total of four – always using the one lauter. The pipework is pre-engineered for minimum disruption when adding a further module so that very little down time is experienced. This modular system can also be applied to the craft range of brew houses from 3HL – 36HL to rationalise capital investment and maximising future proofing. The Birrasalento brewhouse is arranged with four 48 hectolitre multi-function vessels with one 48 hectolitre lauter tun for maximum optimisation. Extract efficiency and speed is critical for all brewers and our control system maintains a constant flow through the Lauter Tun. Using a pump to positively draw down the filtered wort through the grain results in keeping a fixed head of wort above the grain. This combined with the large surface area results in a yield of up to 85% with very low heat oxidation. Another benefit is that the filtration is rapid, normally taking less than 75mins even when using other cereals. High gravity brewing is also possible with the system where we employ a larger diameter lauter. The complete system if fully automated and PLC controlled from grain feeding to discharge and everything in between. Particular attention was taken for the hopping events with the hot wort being taken from the copper during the boil cycle and sent to a special hop injection tank which has three hop dosing units on it. The timing and dosing of these is fully automatic and the cone shaped unit also feature a very special patented mixing system and nitrogen environment to control hot oxidation….. A further hop back with automatic dosing and removal gives maximum flexibility for flavours. All of these items are located on the same level as the brew house for ease of operation and also for health and safety considerations. Cooling of the wort is with a tubular heat exchanger which much more flexibility in the types of ingredients that can be used in the brew without blocking plates. The grain handling system was supplied by Simatec including bulk silo, 1 tonne bag feed, special ingredient feeding and milling equipment along with feed conveyor to the brew house. The hot and cold liquor tanks from Simatec also controlled by the central PLC to give maximum energy recovery and reduction of energy costs. With the system configured with four mfv’s these are sized at 3 times the brew length to ensure liquor is available at all times. Spent grain is automatically discharged outside to a line of waiting specially constructed carts arranged in a train. With a fully automatic brew house cleaning is a key consideration and Simatec supplied a three tank automatic CIP set adjacent to the plant. As well as CIP spray balls for instance in the lauter there are also CIP spray nozzles below the lauter plates as well as a special cleaning cycle for the spent grain removal arm using a high pressure water curtain. Simatec Srl themselves started some years ago as an aspiring brewer. 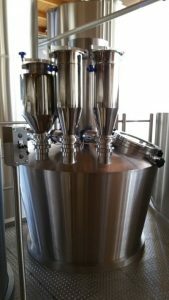 Not finding the technological solution they wanted in their own brewhouse to achieve the goals of low hot oxidation, increased extract performance, fresh taste profile and low filtration inspired them to start manufacturing brew houses as well. Thus was born the perfect partnership between equipment manufacturer and the brewer. This partnership has been ongoing resulting in continual development and improvement of the product over time. One recent example is the trend for dry hopping which can cause some challenges for both costings and tank hygiene. Simatec developed the “isobaric hop injector” or IHI for short. This unit utilised with the conditioning vessel reduces hop consumption by around 50-60%, can reduce tank time by 2 days and results in a conditioning tank easier to clean. It can also be used for special ingredients addition such as spices, peppers, sugars, raisins etc. and oxidation too. Enterprise Tondelli supply modular brew houses from 3 hl to 96 hl for up to 12 brews per day along with packaging plants for bottles, cans and kegs. From Single machines to complete turnkey projects. Further information and other case studies can be found here or by phone on +44 (0)1525 718288.